Fuerteventura Airport - "El Matorral", is located only 5 km from Puerto del Rosario and 8 from Caleta de Fuste, one of the resorts on the island. Previously, the airport was in Tetir (1930) and it was only an emergency landing, later moved to Tefía (1940), and then moved closer to the capital, tobacconists (1952), with the peculiarity in this Finally the single runway airport across the road, so in the landings was due to stop the traffic of cars and trucks off the road between Puerto del Rosario and Tetir. Recently remodeled and expanded, this modern airport offers travelers one of 1,200 parking spaces, a commercial offering that includes pharmacy, restaurants, newspapers, gifts, boutiques and drinks and snuff, as well as outdoor areas for smokers. It opened in 1969, with a flight from Las Palmas - Fuerteventura - Lanzarote, and in 1973 when they start international flights connecting the island with the airline Condor Dusseldorf. The majority of airport traffic is with countries of the European Union. Germany and the UK account for 74 percent of international traffic. The national focus on three destinations: Gran Canaria, Madrid-Barajas and Tenerife North. The airport is also connected to other Spanish destinations such as Bilbao, Santiago de Compostela and Seville. In 2009, he received 3,738,492 passengers on 36,429 flight operations recorded. Freight traffic reached 1913 tons. In short, there are more than 36,000 flights to Fuerteventura each year. Desalination plant: Water, on an island with scarce rainfall as Fuerteventura is a very precious. The airport has built a water treatment plant of sea water with reverse osmosis desalination with a capacity of two hundred cubic meters per day, which meets the needs of the airport grounds. It also has built a reservoir of drinking water for up to two thousand cubic meters, sufficient in providing for twenty days. Wastewater: The airport has a purifier which treats one hundred percent of wastewater generated. The plant has a treatment plant with a planned capacity of 275 cubic meters per day, using the aeration and decanting. All purified water is stored and uses them for later use in irrigation of landscaped areas of urbanization. 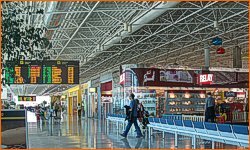 Thanks to this store have been landscape over a hundred thousand square meters of the development of the airport, creating a large green area in which they have cultivated many species native to the Canary Island flora.